25 years ago, if Arnold Schwarzenegger and Sylvester Stallone had announced they were co-starring in an action movie, the universe would have imploded in on itself from the sheer unnatural force of our incredulousness. The two most bankable, beloved action stars in the world – their personae based entirely on their own masculine godhood – sharing the screen in an action-adventure that, surely, would have made the most of their shared screen time to present the greatest action movie in history? The world couldn’t possibly handle it. It would have been the event of the decade. 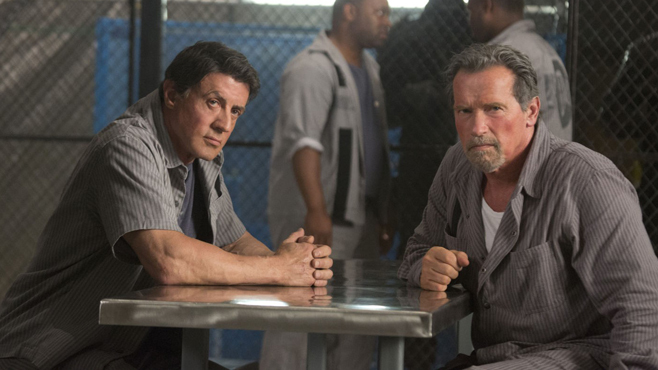 But it’s not 25 years ago, and Escape Plan – the first true on-screen pairing of Schwarzenegger and Stallone, since Arnie’s cameos in the Expendables films were little gags at best – is coming out with hardly any fanfare, in the middle of October, and from what I can tell its release has been overshadowed by a remake of a horror movie. Strange, strange times indeed. 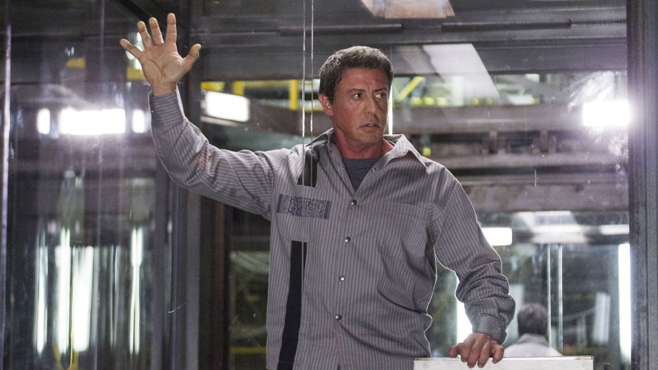 Stranger still, Escape Plan deserves no better: it’s a middling, merely watchable thriller that defies every boyhood expectation of my generation. In other words, they finally got Arnold Schwarzenegger and Sylvester Stallone to co-star in a movie, and THIS is what they came up with…? Stallone plays Ray Breslin, a prison security expert hired to break out of various institutions to test their breakoutability. 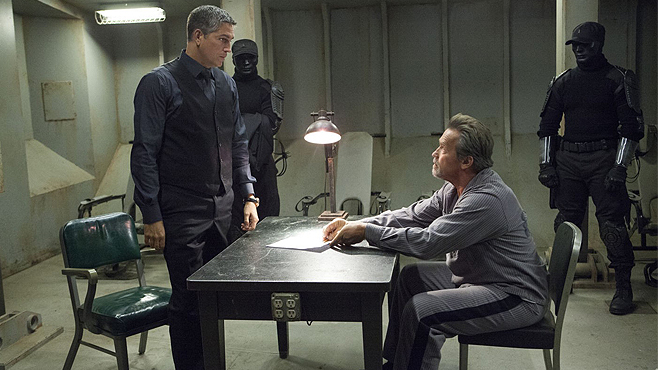 He’s hired by the CIA to escape from an off-the-books incarceration facility, but when he gets there, he discovers that Warden Hobbs, played by Jim Caviezel, thinks he’s a real inmate, and that the prison itself has been designed to combat the very escape methods that Breslin himself devised. To facilitate his most difficult job yet, Breslin teams up with a mysterious con named Rottmayer, played by Schwarzenegger, who needs to get out as soon as possible because Hobbs is trying to break his spirit and extract valuable information about his vigilante associates. It’s an enjoyably high concept, and the script by Miles Chapman and Jason Keller seems to genuinely get off in the minutiae of Breslin’s attempts to break out of the prison invented for him. The prisoners have no privacy whatsoever, their cells being made of clear (and presumably rather thick) plastic. The guards are unrecognizable in their black masks, making it nearly impossible to learn their habits. Even the location is a mystery, since the inmates are never allowed outside. Escaping will definitely be a major feat. But the prison is also so preposterous that Breslin is forced to rely on ridiculous coincidences and the ineptitude of Warden Hobbs to escape. Hobbs is swiftly defined by his exactitude and calculating demeanor, but he then embarks on a series of boneheaded moves without which the plot of Escape Plan could never progress. Although director Mikael Håfström keeps the film humming along at a brisk pace, the plot is centered around a villain who is supposed to be too smart to make a series of highly suspicious deals with his inmates and never even frisk them for contraband. 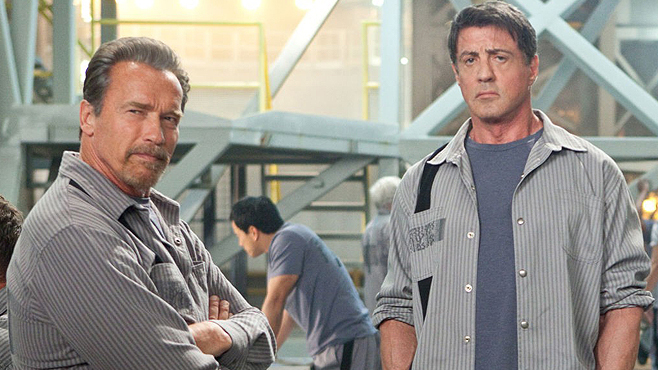 Escape Plan also centers around two heroes who don’t fit into Schwarzenegger’s and Stallone’s profiles. Breslin is supposed to be a canny genius, making constant connections and solving impossible problems, and Rottmayer is supposed to be an enigmatic people person with a sharp sense of humor. Both actors are more accustomed to filling a room with their towering swagger than with expressing believable, genuine wit, leading to extended sequences of Stallone saying smart things but looking like he only understands the gist of it, and Schwarzenegger hamming it up with bizarre insults about getting fellated by a fellow inmate’s mother. It’s certainly entertaining to watch Schwarzenegger trying to coast on sheer personality, but the film only seems to sing when he unmounts a giant machine gun and starts blowing away guards with impunity. While this is not to say that Arnold Schwarzenegger and Sylvester Stallone should be forced to make brawny action movies throughout their entire careers, their range apparently doesn’t extend to devious masterminds on par with Lex Luthor, Hans Gruber and Keyser Soze. They’re simply miscast in a film that clearly understands what we want to see from them in a team up, but that nevertheless forces us to wait until the final minutes to deliver the action-packed goods. Until then Stallone and Schwarzenegger are stuck doing the best they can with a script that was clearly intended for very different types of performers, and that isn’t quite as clever as it thinks it is. By trying to fulfill the promise of its screenplay and the promise of its casting, Escape Plan falls short on both counts. It’s a merely amusing trifle, never once achieving the full promise of its genre trappings, and seems destined to be a considered a historical footnote. Schwarzenegger and Stallone actually co-starred in a film once. Remember that? William Bibbiani is the editor of CraveOnline's Film Channel and co-host of The B-Movies Podcast. Follow him on Twitter at @WilliamBibbiani.